GeorgeCo spent the past weekend at the track in both the GeorgeCo MINI powered by Beano and the GeorgeCo Porsche. Why the switch? GeorgeCo ran all day Friday in the MINI until the tires were shot. Light rain in the morning made the first session loads of fun. Getting home, I also realized that I killed the upper motor mount running on the banking all day. 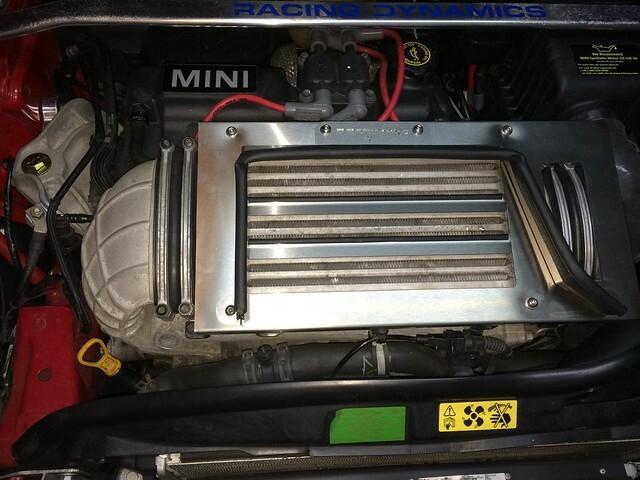 For the 2005 model year, MINI switched from a rubber upper mount to a hydraulic mount. If you open the hood and see black goo seeping from the mount then you know it’s shot. 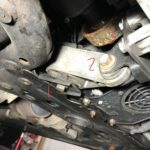 Don’t keep driving because the left side of the engine (which is actually the front in a transverse mounted engine) will droop, causing all sorts of other problems throughout the drive-train. 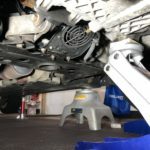 OEM motor mounts run about $100. We’re replacing this one with a more robust WMW/TSW Urethane Upper Motor Mount. 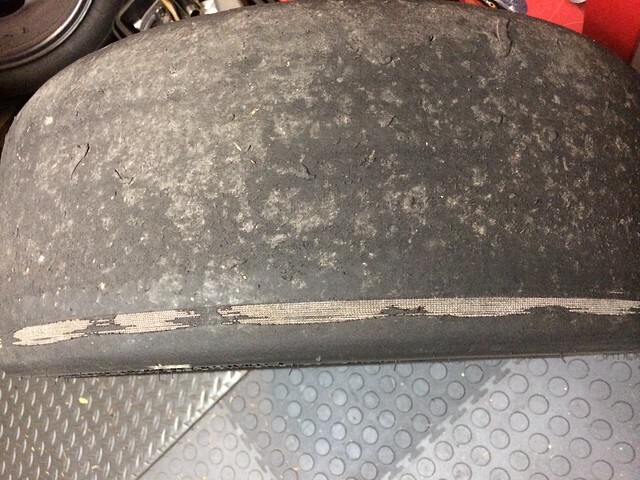 They run about $200, but should require replacement less frequently, especially in a car that sees a good deal of track time. 1. With the car on the ground, loosen the lug bolts on the front right wheel. 2. Place the car on jack stands. You can do just the front right, but I like to raise the entire front since it makes it easier to work the jack under the engine later. 3. Remove the front right wheel and fender liner. 4. Place the jack under the oil pan, and use a piece of wood to gently raise it until there is pressure on the motor. You don’t want to lift it, just support the weight of the engine on the jack. 5. 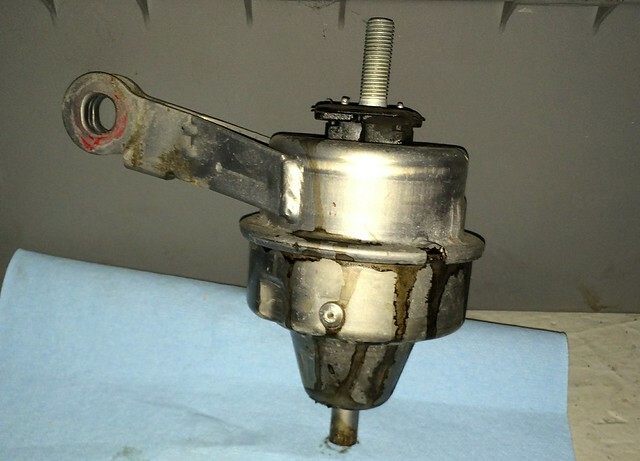 Remove the upper nut on the OEM oil filled motor mount. 6. Remove the M12 bolt holding the engine mount stabilizer arm to the shock tower. 7. Remove the engine grounding strap from the motor mount bracket. 8. 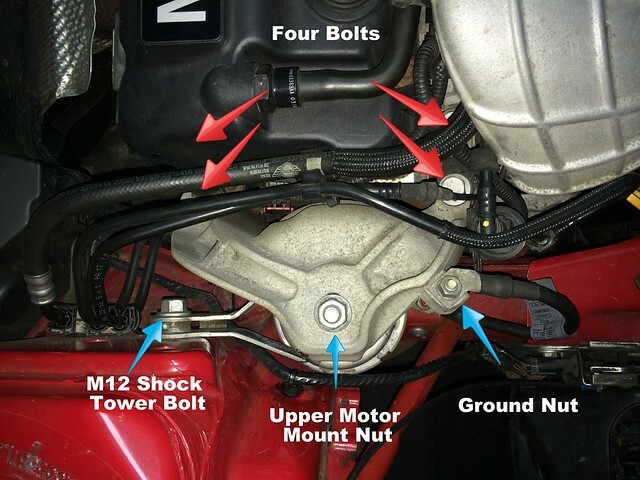 Remove the four bolts holding the upper motor mount bracket to the engine. These can be difficult to remove if they are corroded. A little PB Blaster may help. 9. Now you can remove the old motor mount. Remove the Torx T12 bolt from the bottom of the frame rail. 1. Place the new motor mount into the same hole in the frame rail as the old one. 2. 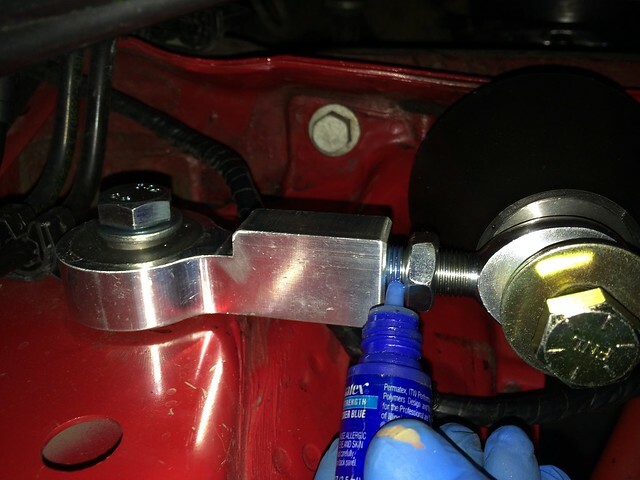 Put a small amount of blue Loctite on the threaded end of the long Torx bolt; push it through the frame rail from the bottom; and hand tighten. 3. 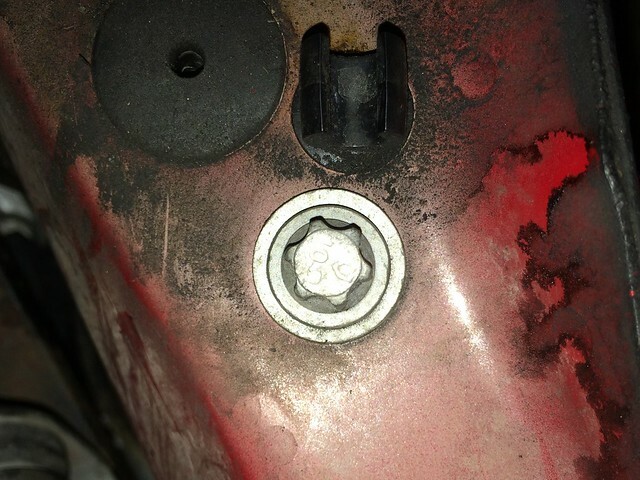 The Torx bolt is a “torque-to-yield bolt” so you can tighten it once and then it has to be discarded. Tighten to 41 ft-lb of torque plus a torque angle of 90 degrees. 4. 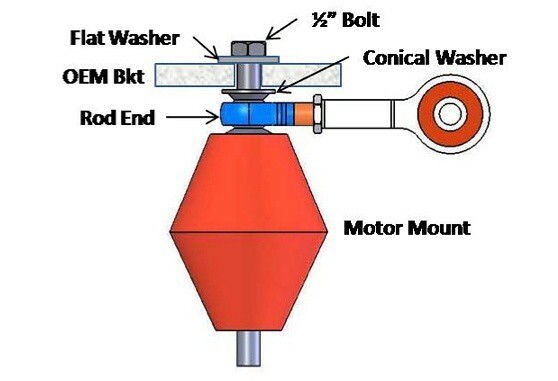 Place the rod end of the dog bone on top of the motor mount, then put the conical washer on as shown in the image below. Temporarily place the washer and nut on top of the mount and hand tighten. 5. Adjust the threaded portion of the rod end until the other end lines up with the shock tower (notched side toward engine.) Thread the M12 bolt and washer by hand into the shock tower. Make sure the dog bone is not putting any stress on either the motor mount or the shock tower. 6. Back out the rod end locking nut away from the dog bone end and put a small amount of blue Loctite on the threads near the dog bone. Tighten the locking nut by holding the dog bone end with one wrench and use another to tighten the nut. It only needs about 30 ft-lb of torque. 7. 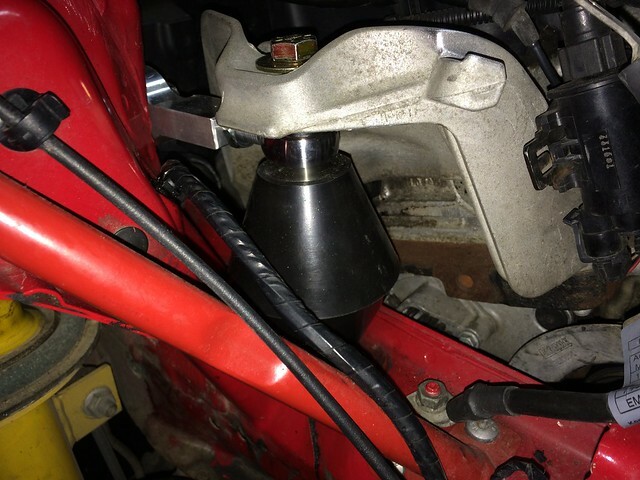 Remove the bolt and washer from the top of the mount and place the OEM upper mount bracket on the engine. You have to wiggle it in a bit, but it will fit between the engine and the new motor mount. Tighten all four bolts by hand, but leave some play for now so you can get the top bolt aligned. 8. 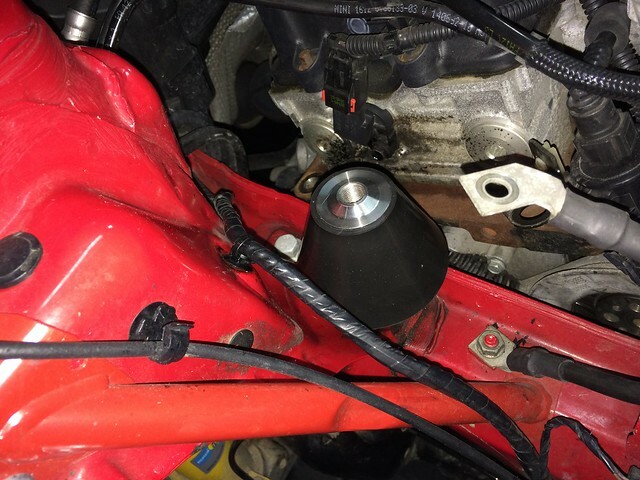 If the engine has moved, use the jack to reposition the engine so the hole in the top of the mounting bracket lines up with the top of the mount. Thread the top bolt and washer by hand. 9. Tighten the four upper motor mount bracket bolts to 60 ft-lb. 10. Tighten the 1/2 inch upper motor mount bolt to 45 ft-lb. 11. Check the M12 dog bone bolt to shock tower to make sure it will still back out (doesn’t bind). If it does bind, adjust the dog bone in or out and re-tighten the locking nut. The dog bone should not have any pre-load or you may get engine vibration. 12. Tighten the M12 bolt to shock tower to 45 ft-lb. 13. Replace the ground strap and tighten to 18 ft-lb. 14. Remove the jack from under the engine. 15. Replace the fender liner and wheel. 16. Torque the wheel bolts to 87 ft-lb (or as appropriate). 17. Lower from jack stands and you’re done. Update: Hated the Urethane motor mount and swapped in a new OEM style mount. Will just have to keep an eye on it to prevent future failure.